Central banks keep pulling their one lever to "fix" the economy, but nothing is fixed. 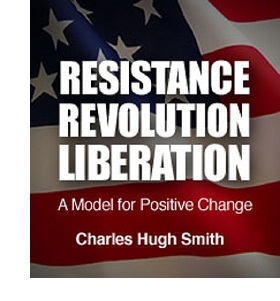 Monetary easing only compounds the problems. Stripped of acronyms and pseudo-economics, Central banks have one lever: monetary easing. Whatever the name offered for creating money electronically and suppressing interest rates, it boils down to making money abundant and cheap to borrow, at least for banks and other favored players, such as buyers of homes using 3% down-payment FHA mortgages. 1. One primary problem with the real economy is there is too much debt, too much leverage and too little collateral. 2. Making money cheap and liquid only compounds this problem. 3. The other problem is household incomes are stagnating, making it difficult to service the monumental debt carried by households. 4. Making money cheap and liquid for banks and speculators does not funnel money into the real economy or households, so it neither reduces debt loads nor boosts incomes. Easy money flows into "risk-on" speculations like equities. The one "achievement" of the Obama administration and the Federal Reserve is the Bull market in equities since the March 2009 post-meltdown low. Note that the ratio rose smartly in the 1990s as equities experienced strong growth while the monetary base remained stable. This Bull market did not depend on a rapidly expanding monetary base. Now look at the red line during the 2009-2012 Bull market. As the monetary base exploded higher, the ratio of equities growth and monetary growth plummeted as monetary expansion completely swamped the rise in equities. A stupendous rise in the monetary base yielded a comparatively modest rise in equities, a reality reflected in the nearly flatlined ratio line. The standard measure of money in the real economy, M2, has also gone nowhere when correlated to the monetary base. 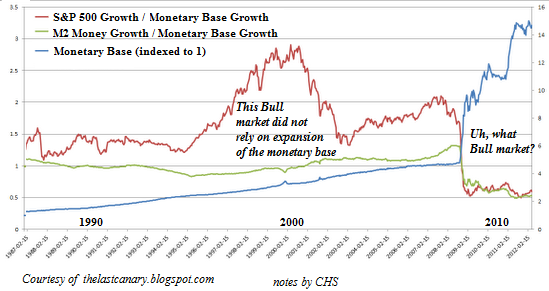 This chart reflects an economy and stock market that is increasingly immune to the expansion of the monetary base. Incentivizing debt and leverage does nothing to reduce leverage or debt, and incentivizing speculation does not reduce household debt loads or increase household incomes. And without improving household incomes, you have a recessionary economy held aloft by unsustainably profligate Federal borrowing and spending. Is this a "solution"? No. Is this sustainable? No. Thank you, Gaylan P. ($5/month), for your exceedingly generous subscription to this site--I am greatly honored by your support and readership.